Dodge City's livelihood has long depended upon its ability to reinvent itself. It was born of the Santa Fe Trail, developed with the coming of the Santa Fe Railroad, and looked to the New Santa Fe Trail - Highway 50 - for renewal. While Dodge City was remaking itself, the entertainment industry was capitalizing on its place in American popular culture - as the stereotypical Wild West town. While the protagonists of dime novels, movies, and television series like Gunsmoke’s Matt Dillon were telling bad guys to "get the heck out of Dodge," tourists flocked to the legendary town. By the mid-20th century, the city's efforts to live down its rowdy past were overwhelmed by the potential for capitalizing on it. 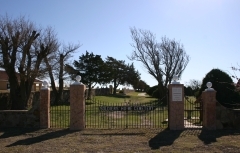 Locals had been advocating for a Boot Hill museum as early as the 1920s, but it wasn't until after the 1939 world premiere of the movie Dodge City, which firmly placed the town within the popular culture lexicon, that the city commission issued bonds to begin construction. The site developed in stages and was largely complete by 1964. 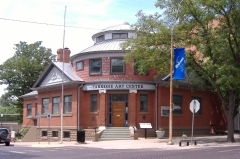 Boot Hill Museum was nominated as part of the "Roadside Kansas" multiple property nomination for its significance in the areas of entertainment and education as a mid-20th century museum that interprets Dodge City's history as a cowtown and for its association with the local tourism industry. Built in 1927, the residence located at 603 West Spruce was nominated for its architectural significance as a good local example of the Dutch Colonial Revival style and for its associations with successful Dodge City businessman and real estate developer Hiram Burr. Approximately ten percent of Colonial Revival homes have gambrel roofs and, thereby, fall into the category of Dutch Colonial Revival. Unlike most examples with one gambreled mass, the roof of the Burr House is cross-gambreled. In addition, unlike most examples found in Kansas, which tend to be frame construction, the Burr House was constructed of brick. 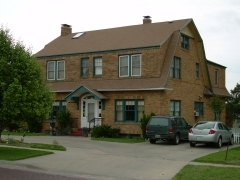 The home is situated just blocks northwest of downtown Dodge City on Boot Hill. The home's design conforms to the terrain of Boot Hill, which slopes downward from north to south. Downtown Dodge City's livelihood has depended upon its ability to reinvent itself. While its roots stretch back to the days of the Santa Fe Trail, the downtown developed with the coming of the Santa Fe railroad and later redeveloped with the growth of Highway 50. 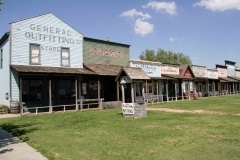 While Dodge City was remaking itself, the entertainment industry was capitalizing on its place in American popular culture as the stereotypical Wild West town. By the mid-twentieth century, the city's efforts to live down its rowdy past were overwhelmed by the potential for capitalizing on it. The district encompasses much of the downtown and includes the historic brick streets and commercial, civic, and religious buildings reflective of architectural styles from various periods of development. 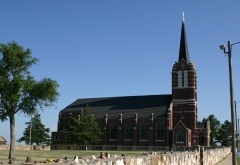 Dodge City's downtown was nominated for its reflection of historic architectural styles and its association with the development of Dodge City from its days as a railroad hub through the post World War II era of the mid-twentieth century. 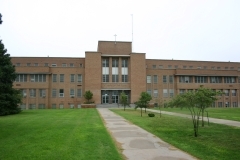 The Dodge City Municipal Building was designed by Mann and Company, Architects and Engineers of Hutchinson, and constructed in 1929 by contractor J.N. Parham. Built to house municipal offices, a police station, and a fire station, the building is characterized by a unique design incorporating both Mediterranean and Modern influences. 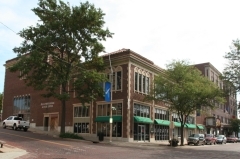 It is centrally located adjacent and north of the Boot Hill Museum and occupies a corner lot in downtown Dodge City. The site also contains three commemorative markers, a statue of a cowboy, and two Corinthian column lamp posts. It was nominated for its local significance in the areas of government, social history, and architecture. Electricity was first introduced to Dodge City in 1886 after the organization of the Dodge City Electric Light Company. The energy plant was first located in a two-story building on West Trail Street built between 1885 & 1886 for the Dodge City Planing Mill. Also occurring in 1886, the city's first waterworks facility was constructed as a two-story brick building to the immediate southeast of the planing mill. The electricity facility moved downtown in 1887, and beginning in 1890, the city's electric service and water works were combined and operated out of a single brick building on what is now Gunsmoke Street. In 1897, both services relocated to the old waterworks building on West Trail Street. 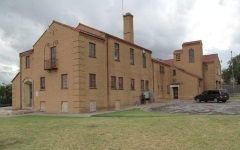 Over the next several decades, the physical plant evolved in name, function, and form, especially after the city erected a separate waterworks building in 1910 when they took over operation of that service. In 1927 the electricity plant became known as the Kansas Power Company, and by 1932 it gained its current form. It was also in 1932 that a new electricity plant was constructed to the east of Dodge City. The "old plant on Trail Street" was then used as a reserve facility through the 1990s. 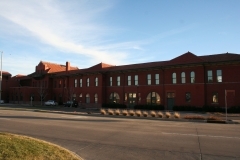 The Kansas Power Company Plant is nominated for its association with the beginnings of Dodge City's public works and energy development from circa 1907 to circa 1932. In January 1890, Fort Dodge was deeded to the State of Kansas for use as a Soldiers' Home. The Kansas Soldiers' Home Cemetery is the final resting place of veterans, spouses, and civilians from the Civil War, Indian Wars, Mexican War, Spanish American War, World War I, World War II, Korean War, and Vietnam War eras. The cemetery occupies three acres of land and is divided into three sections: Civil War, Spanish American War, and World War sections. It was nominated for its association with military history.